This is one of the ideas that I came up with recently. I have been going through a real bath phase. Is that a thing? I dunno. Go with it. Until recently I didn’t really appreciate the magic that is the bath. Well, not since I was six years old and would re-enact the entire Little Mermaid from beginning to end DAILY in the tub. I wanted to be Ariel. I dream big. My mom would have to start playing my Little Mermaid tape on my Lil’ Tikes tape deck before my toe would touch the water. She also was not allowed to get me out until I had belted out my last glorious note. Obviously the best part of this whole process was the part where I got to flip my hair over and sing the “AHHHH-AH-AHHHHHH-AH-AH-AH-AH-AHHHH!”. Magical. Although bath time is no longer prompted by soundtracks (although…that sounds fun). It has been this beautiful relaxing winter meditation time. A time to get warm and relaxed and just zone out. Maybe read. Maybe just sit and breathe. I’m a huge fan of Epsom Salts. Have you ever read the side of the bag of those things? They literally do everything. Sore muscles? Epsom salt it up. Gardening difficulties? Epsom salt it is. Digestive issues? Knock back some Epsom. It’s the girl Friday of salts. So why not create our own lovely smelling bath soak? It’s basically like giving someone the gift of relaxation. Here, have a little miracle in a jar, on me. You are important. Breathe. Relax, you so deserve it. Want to know the best part? It takes just a few minutes to put together. I make them with a per-jar ratio. If you want to make multiple jars, just double, triple, or quintuple the recipe. 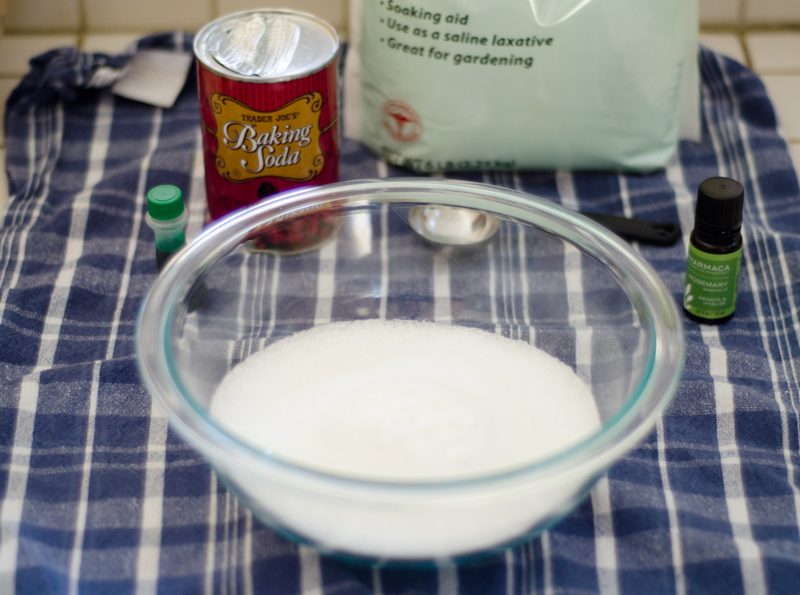 Measure out your salt and your baking soda, and dump them into a mixing bowl. Add in your essential oils and your food coloring. Mix together until the color is evenly distributed throughout the salts. 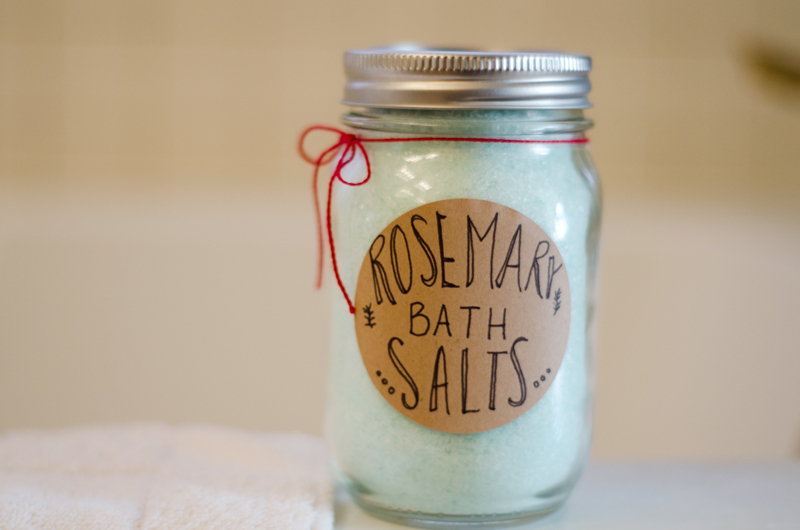 Funnel your bath salts into your mason jar. Look how cute it turns out! Just a few minutes of work. You are a total champ. I would love to bring back that tradition. Bubble bath theatre. Love your mermaid memories 🙂 And these look so relaxing! Thanks, Steph! They are relaxing indeed. I did a little test run with the leftovers. Thinking about making myself a jar to keep. 🙂 Just checked out your blog and it is super cute! So much craft-spiration! Hey girl! It’s crazy around Marin right now, right? I live over near the village and Towne center and every time I head out to run errands, I’m stuck in the mall traffic. I have to leave 10 minutes earlier than usual just to get somewhere on time. Did you know that Safeway has the 14oz bags of shredded coconut on sale right now? I picked up 2 bags last week and there were tons left. Your bath salt looks great and I’m totally going to make some up, as I love taking a bath and I have 4 huge rosemary bushes in my backyard. Yes! It is a madhouse everywhere!! Safeway was the first place I looked for coconut, and they were OUT. Even in the back. Holiday baking is at another level right now. Sounds like your 6 year old self would love my surfboard with the little mermaid on it! It was a wedding present, so proof that you can always love the little mermaid. Or in my case, your uncle can enough to put her on a surfboard for you. Michelle. I can’t handle it. That is glorious. How much do you use in a full tub? I like to use 1/2 to one cup of bath salts per full bath. Hey just wondering what color you used for the food coloring to make the light blue color bath salt pictured? Believe it or not, I used a bit of green food coloring. It seemed to make it that light minty blue color. I am going to make the bath salts and the sugar cookie foot scrub for 7 women. I also have 4 guys to make gifts for. Haven’t decided on what yet for them. Thanks for the recipes. Thank you for this amazing recipe! I can’t wait to try it! I never used food coloring before, so what type do you have? Or what brand do you recommend? I was wondering if I could use homemade food coloring for this do you think? Like I was going to try making my own purple with cabbage. How could we use real rosemary in this instead of rosemary oil? Deborah, I grow rosemary and dry it to use in foods. I would suggest running it through a coffee mill to grind it down or use a mortar and pestle. I think dried would work better than fresh. Maybe this will work for you, good luck! I’ve been making bath salts as well, but may I ask what the baking soda does? P.s. Orange Lavender is my favorite scent to soak in! 1/2 cup of baking soda softens the skin.. 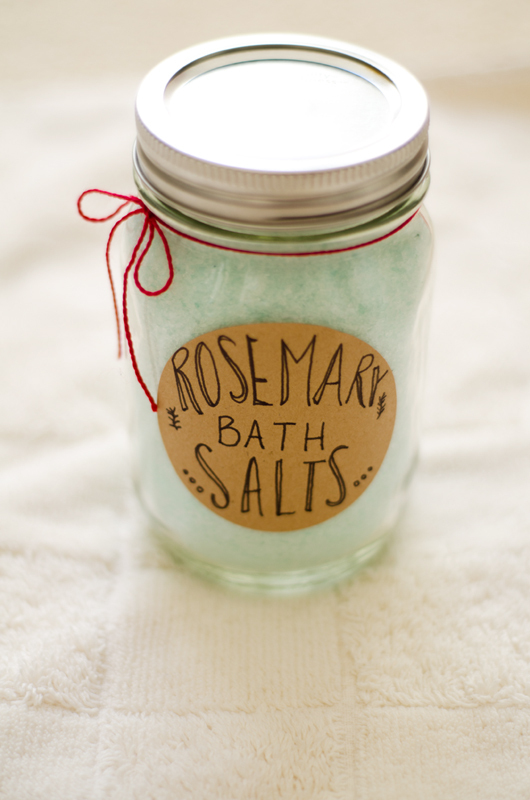 I made these bath salts and I love them! I have changed out the essential oil and added rose petals or lemon zest depending on the scent. Thank you! do you have a link to print out the labels you used for the jars? Hi Lynn! I don’t. I actually hand wrote my labels. I just used a brown craft paper label and a fine point black marker pen.